Revamping and reviving the pool, an upcoming birthday or a pool party often prompt people to purchase a water basketball hoop. There is a lot of choice out there making it difficult to decide which one to go for. If you are in that position you have come to the right place for help. 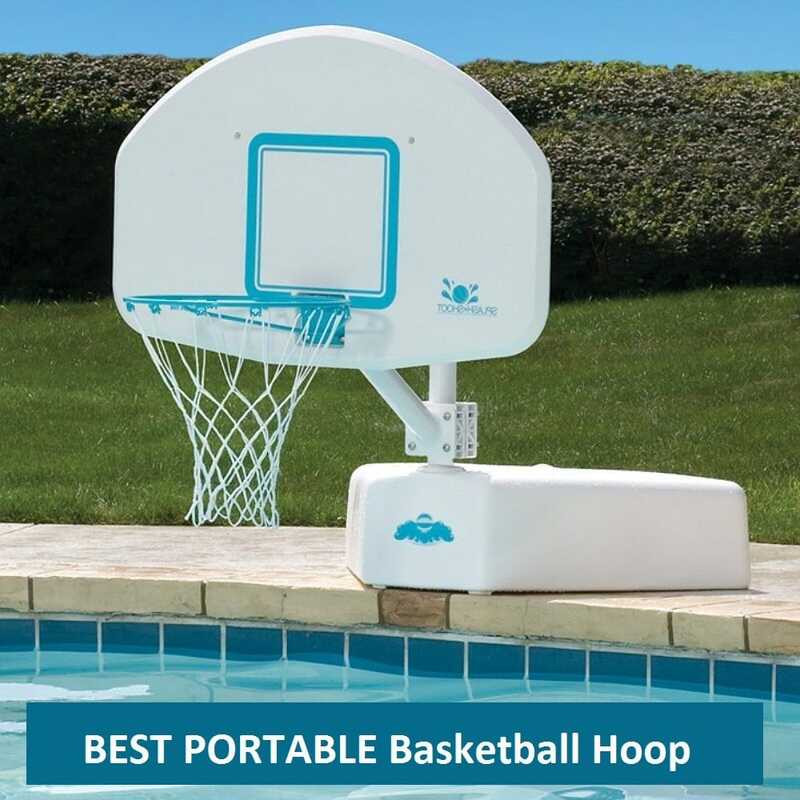 We review the most popular pool basketball hoops below the chart to make it even easier for you, saving you time and money. Color scheme looks good at most swimming pool settings. No rust hardware: The materials used are no rust in themselves. But Dunnrite went one step further and coated everything as well, really a belts and braces approach to withstand harsh pool conditions. Stainless steel rim with vinyl coating, powder coated aluminium post and stainless steel assembly hardware ensure a long life. Our Best Value for Money hoop for in-ground pools has to be the Lifetime 1306. This is a height adjustable portable sturdy basketball system with great value. There is also the almost identical Lifetime 1301. The only difference between them is the backboard. Differences in price really come down to competition in the market place. with High-Density Polyethylene (HDPE) surface. so will look still look great after a few seasons. glass-like transparency and is impact resistant. We recommend the Lifetime 1306 simply because we prefer the clear backboard over the one of the Lifetime 1301. Even though a ball isn’t included (get a regulation sized one or a junior size for younger kids) in neither the 1306 nor the 1301, it’s great value at around $140. Both models feature a powder-coated (i.e. it should last longer than merely painted) steel pole. Even though this is better than paint, it will only be a matter of time until a tiny bit of steel is exposed and starts to rust. It’s better to spray all painted surfaces with a clear coat or Rust-Oleum to keep it good-looking for more than one season. The telescopic height adjustment allows heights between 4′ – 6.5′ in 6″ increments. The base (43″ x 30″ x 7″) can be filled with water or sand and won’t move even in the most heated game. It doesn’t allow hanging from the hoops for older kids and teenagers but will cope nicely with slam dunks. We like the see-through backboard and slim base, making the hoop less obtrusive than big bulks of plastic. 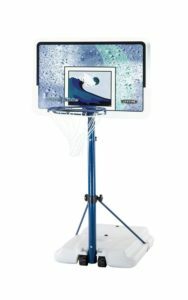 WATCH THE VIDEO below to see the Lifetime 1306, our most recommended and overall best pool basketball hoop, in action. The only way to avoid the basketball hoop becoming a rusting eyesore is to go for a stainless steel model. 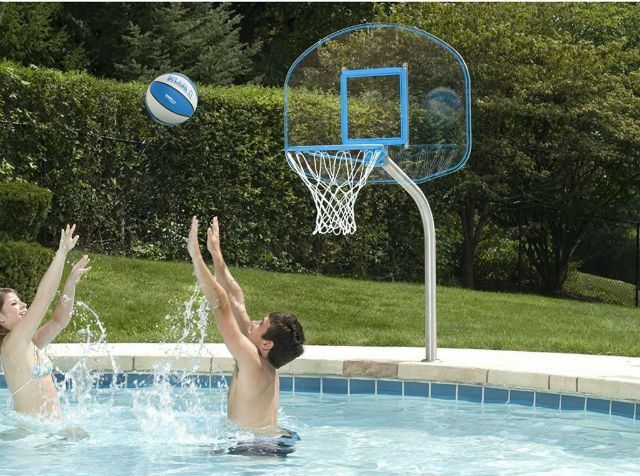 The Clear Swimming Pool Basketball Hoop by Dunnrite is a very elegant, sharp looking, lasting solution. Good, lasting quality comes at a price. At $499 (including free shipping on Amazon) it’s the most expensive hoop. We think it is well worth it because it is clearly designed for a harsh pool environment. If you have already a sleeve in your deck or can get a concrete cutting company to drill a hole for the post (diameter 2 3/8in) you won’t need the hassle of filling a plastic base with water or sand. But what’s more, the clear ⅕ inch thick clear backboard and curved stainless steel post look minimalistic, stylish and will do so for years to come as there is nothing that can rust. Dunnrite offers two hoop sizes. 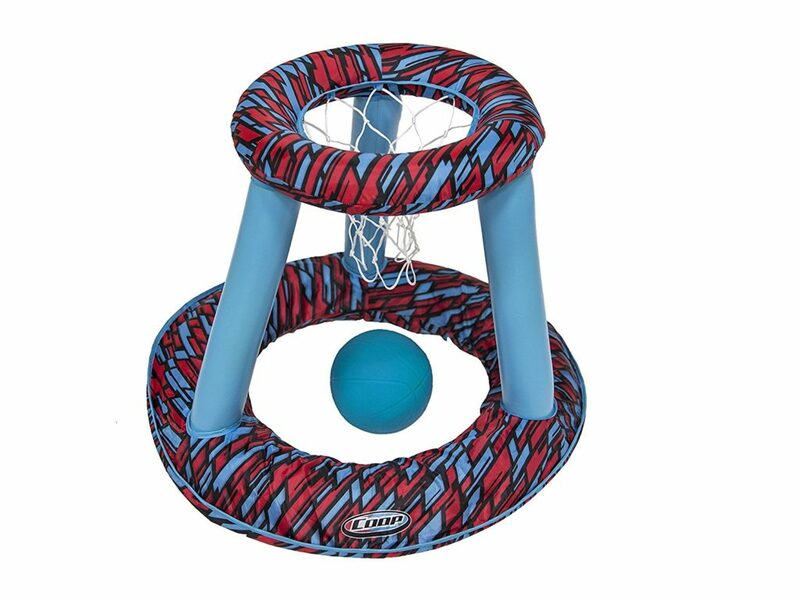 The Junior is a little smaller in diameter allowing younger players to have fun with the smaller ball whereas the Regulation hoop is standard basketball size. Both sets come a with color-matched blue and white water basketball. If you want to get really serious you could even check out some proper pool basketball rules here. Here are three hoops for kids and family fun. The kind you can plonk on the deck and start shooting. We did make sure we only include models that are secure enough to not being pulled into the pool. Here is what we found for under $200. A new design with a clever idea to reduce bulkiness by the poolside and when stored. Water filled base for safety. Stainless rim should ensure a long life. 3 Year warranty!!! The manufacturer will replace defective items at no cost to the purchaser. 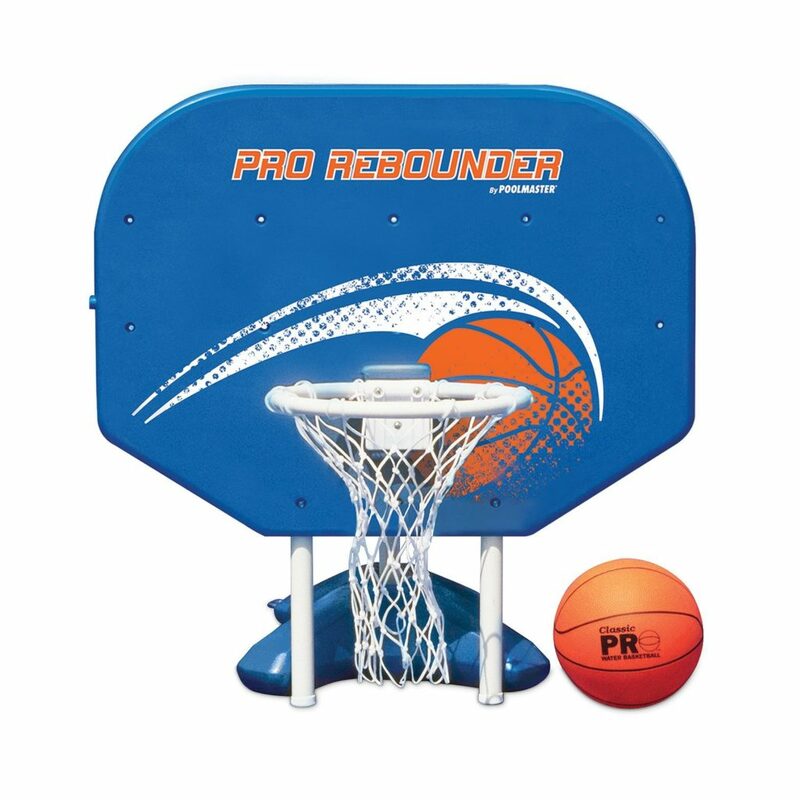 The Rebounder has been around forever. it does have its flaws but still provides good play value, the rebound is good. The base is fairly small (18 by 21 inches) making it easy to place it anywhere you want on the edge of the pool. Very easy to assemble and, once filled with water it sits tight on the edge of the pool. The height cannot be adjusted. Unfortunately, even though the rim is stainless steel and the base plastic there is a rust issue. It’s best if you could paint or spray everything with a clear coat. This doesn’t come with stainless steel bolts, so we’d recommend to exchange all the hardware with suitably durable bolts and washers before assembly. VERDICT: Great, sturdy play value. Ideally, add stainless steel bolts and spray with a clear coat FOR LASTING VALUE. The board is identical to the model mentioned above. On this one, the height of the hoop is adjustable to 40″, 54″, and 74″ from the ground. Changing the height is not a straightforward affair because the PVC pipes have to be changed. We wouldn’t recommend it if you want to adjust the height quite frequently, but it’s ideal if you only need to adjust it to your preferred height. The base (18 by 21 inches), once filled with water makes this a stable, secure set up. It won’t tip over unless the game is very energetic but of course doesn’t hold up to any hanging from the rim. Unfortunately, the base has a lot of corners and edges, making the ball jump not always back into the pool after falling through the net but rather outside a lot, so players will have to go and fetch the ball more often than usual. VERDICT: Plastic Basketball Hoop Set with a 14” hoop, worthwhile entry model, definitely portable, but a few impractical flaws. A good buy for around $140. Additional costs to replace hard-wear with stainless steel bolts and washers. 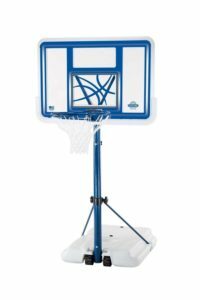 The largest and at around $190 the most expensive model in the large Plastic Basketball Hoop / toy range. The base is filled with water or sand to ensure it doesn’t tip over. Unfortunately, spending $100 more doesn’t solve the rust issue of cheaper products like the Pro Rebounder above. The rim can bend, bolts will rust. In addition, this is quite a big piece of plastic sitting at the side of the pool. For obvious reasons this is for in-ground pools only. Verdict: DO NOT BUY. Go for the Dunnrite Pool Sport instead. If your wallet doesn’t quite stretch to more permanent solutions or you know you only need a short-term set up to keep kids or visitors entertained have a look at the solutions below. These are great options for budding basketball players and can provide a lot of fun and game play. The Intex Floating Basketball Hoop in yellow and green is a great little floater hoop and base! The inflatable beach ball LOOKS LIKE a basketball but is too small! So, forget the ball, use one or a few you probably have lying about anyway and have fun. Being very lightweight, means even a little wind will push this easily to the side and corners of the pool but it doesn’t tip over because the base can be filled with water. But that’s ok as long as you don’t expect more than an inflatable that can ALSO be used for basketball. Kids will very likely start with the ball game but soon find other uses for it: diving under it, turning it over to use as a chair, a raft…you get the picture. Highly recommend as an inexpensive fun toy at this price (only $20 from Amazon – CLICK HERE). 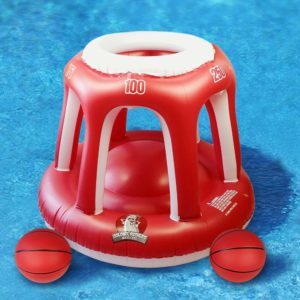 The Hydro Spring Basketball by SwimWays is very similar to the Intex toy, yet better in two ways. A layer of fabric provides more grip and protection and the ball has a textured feel and is easier to hold when wet. The base has a plastic ring at the bottom preventing it from tipping over at the slightest wave. Easy to set up and inflate. The biggest and the only hoop toy we looked at that comes with TWO BALLS. Let’s repeat: this is big! It blows up large to a height of 45-inch tall by 36-inch wide. Get your motorized pump out if you have one. Just under $40 it should last you at least a summer. The hoop doesn’t tip over and the ports on the side allow younger players join in the fun. Different score numbers on above the port are a great feature to invent other games for older kids. Made of strong vinyl it’s also a great pool float and will withstand pretty rough play from older kids. It comes with two grippy water basketballs. Highly recommended. 7 years +. MORE floating, inflatable water basketball hoops for the swimming pool here. 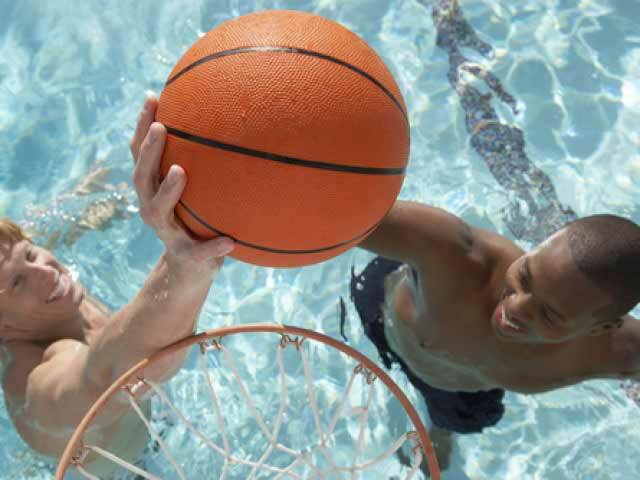 If you haven’t quite found your perfect poolside basketball hoop here, have a look at our checklist to take with you to make sure you consider all important points before committing to buy. And don’t forget to have a look at these epic pool dunk videos here. 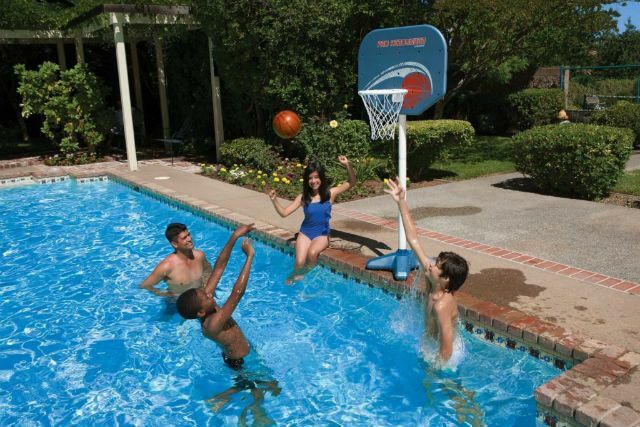 We made sure we cover pool basketball hoops for different ages and requirements. Let us know if you have any more questions or recommendations. Thank you. Such fabulous hoops, and such a range, thanks for the heads up. 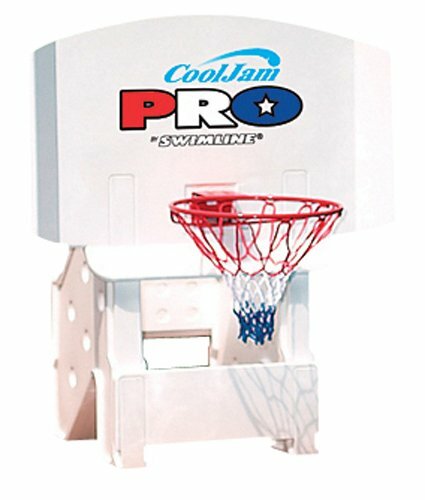 This basketball hoop looks like a ton of fun.I like that is stays right in place once it has water in it. Great, informative article. Great write up! I love the idea of a bit of Bball in the pool!! this is such a dope gift idea for someone for Christmas!! I’m going to bookmark this page and come back to it next Xmas, too late this year I’m afraid 🙂 Thanks for your work, and keep it up! Great article- very systematic. I totally agree, to have an awesome checklist like yours at the beginning makes it so much easier to concentrate on the important points for selecting the product. Got my eye set on the Dunnrite- it will take a little more work to set up, but my feeling is that it’s worth it. Thanks for your review- makes it so much easier to focus and decide which hoop it’s going to be. Would you ship the lifetime 1306 to New Zealand? Hi Stacey, thanks for stopping by and for your question. Unfortunately, the Lifetime 1306 is not available for international shipping from amazon.com. 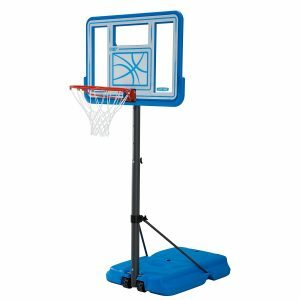 I like the idea of having a portable basketball hoop because I can take it with me just a tad bit easier. This is, of course, assuming that I will have the lung capacity to refill with air! The Lifetime 1301 and 1306 both look like regular basketball goals! It’s hard to believe those are both for the pool. Thanks for the great overview. I like the inflatables because they can be portable to take to the lake house! I’m thinking about this as a great gift for the in-laws for their pool. 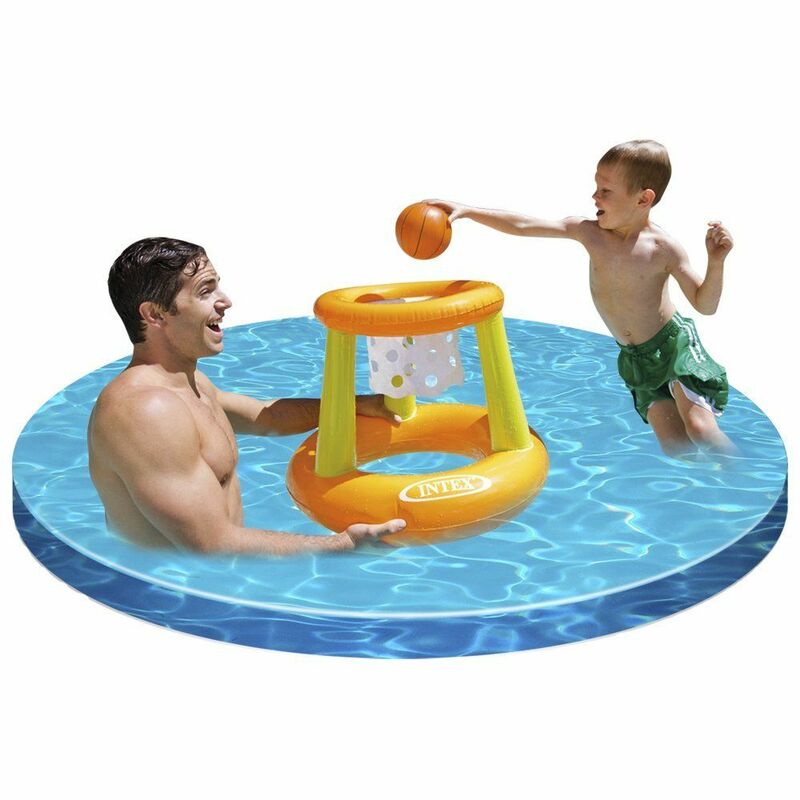 Thanks for the awesome run-down on pool basketball hoops — saved me a lot of time doing research! I found your checklist to be really helpful — i never considered point #4. The Colonel Pickles one looks like the best for my needs because its large enough and won’t tip over. Plus it comes with an extra ball. Maybe someday I’ll upgrade to the Swimline one.